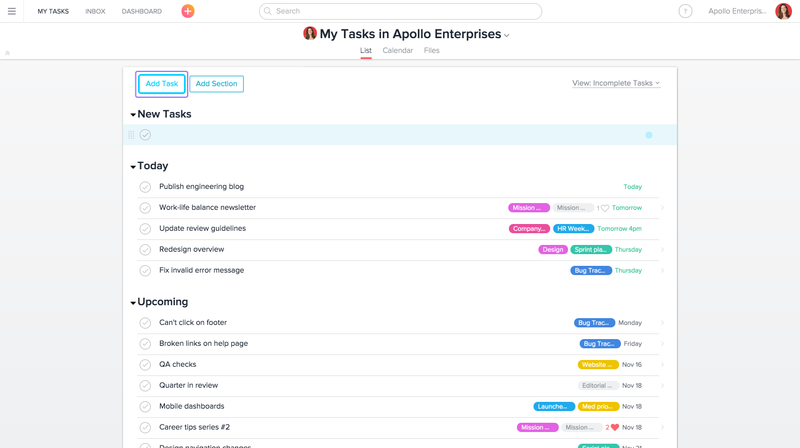 Asana is the easiest way for teams to track their work and get results. If you’re joining a team that’s already using Asana, this onboarding checklist will get you up to speed. We recommend displaying this checklist in another browser window so you can follow along as you get to know Asana. You can also download and print this out for reference. Download and print our onboarding checklist for easy reference. Organizations are the highest level of hierarchy for your business. They are associated with your business’s email account and include all teams. Teams are groups of people in your Organization who work together. Teams can be made up of departments in your company (Engineering, Marketing, Design, Recruiting, etc.) or any group of people who need to work on a set of projects together. 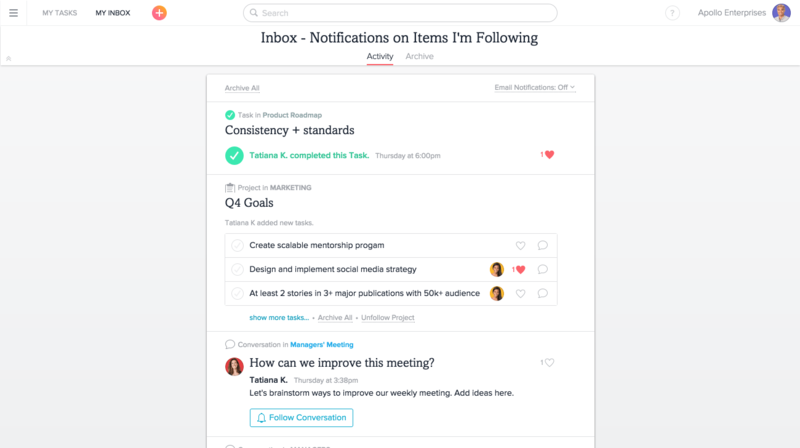 Projects organize your team’s work into lists or boards. Create projects for your team’s latest initiative (i.e. Website Launch), goals you’re working towards, brainstorms, meeting agendas, or any work that requires many steps or teammates. Tasks break down your project into actionable steps. Tasks can be to-dos, requests for teammates, reminders, or ideas. 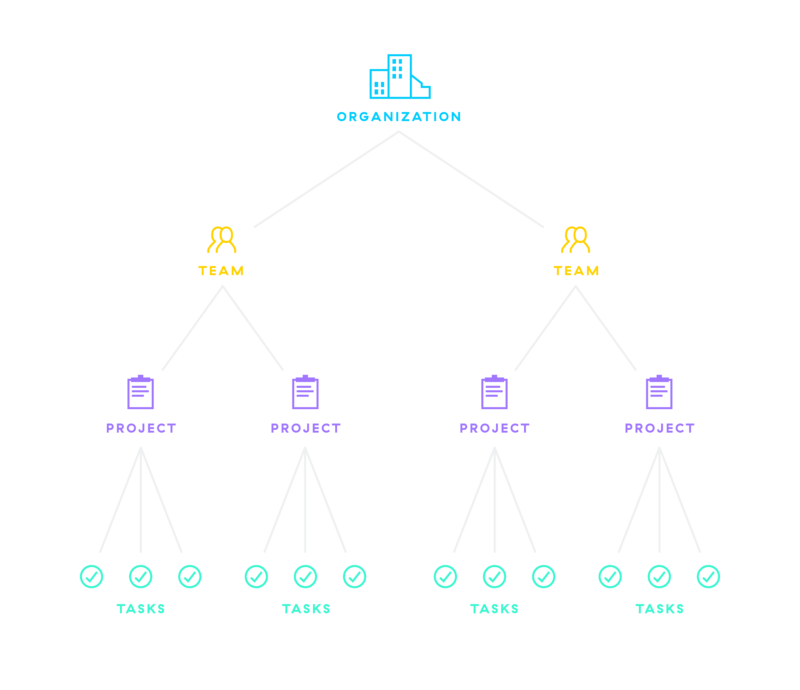 Now that you understand the basics, it’s time to browse and join some teams. Since you’re a member of an Organization, you’ve probably been invited to a team already. Look at the sidebar on the left to view the other teams in your organization. Request to join one if you’d like to access the team’s projects and collaborate with other people in the team. Nested under each team name, you’ll find team conversations (generally used for team-level discussions, announcements, etc.) followed by a list of your team’s projects. 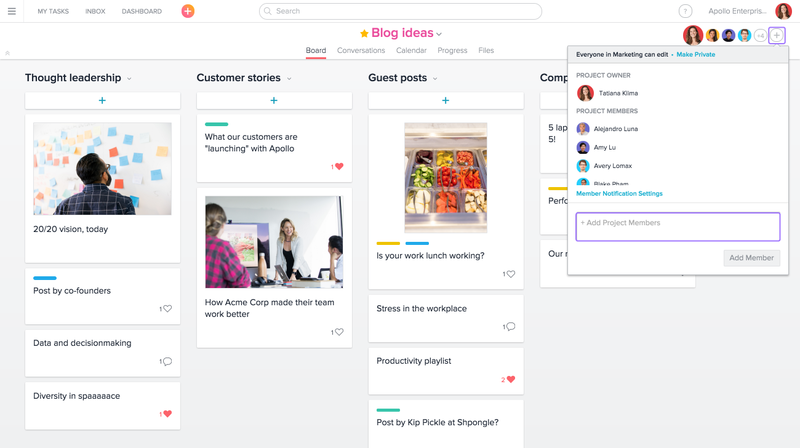 You can view a project as a task list or a board (and within a project, you can see calendars, conversations, and progress charts). Use projects to track and organize all the tasks related to a specific initiative, like a product launch or campaign. Look at the sidebar on the left to see the team(s) you joined in Asana. Click on the caret to the left of the team name to see a list of all the public projects on the team. Start to explore the work in them, and ask your teammates about the projects you should join. To join a project, click the + button in the top right corner of the project. To create a project of your own, just click the (+) button in the top bar and select Project from the drop-down. Give your project a clear and goal-oriented name and description. Projects are made public by default, but you can set the privacy and select the team in which the project will live (via the drop down arrow). 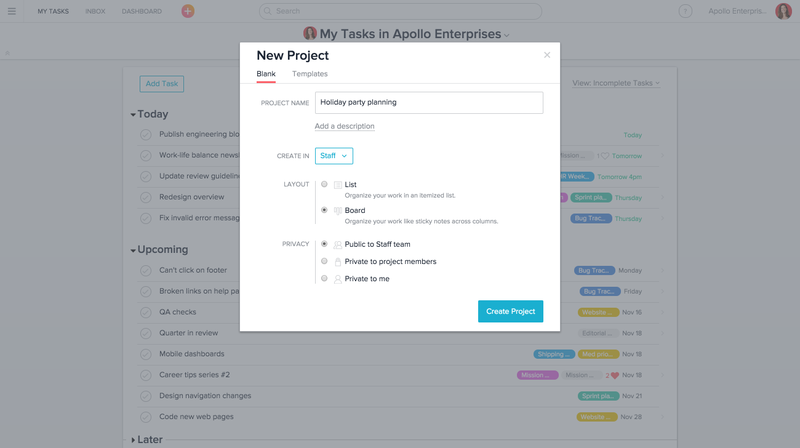 You can also create custom templates for your common workflows or try an Asana-created template to help you get started. Click the + button and select Project, then click on the Templates tab. You can then choose a custom template you’ve created, or start with one of ours and further customize it for your team. We even have an Asana onboarding template! Creating tasks in Asana in simple. In a new or existing project, select a line in the main pane and just hit Enter, or click the + button below a column heading in a board project; or add a task directly from the top bar using the + button. Now try it out for yourself: Create a new task with a call to action and assign it to yourself or a teammate. Be sure to give your task a name, a description and a due date so everyone knows who is responsible for doing what by when. You can also add the task to a project so that it can be easily found. When should you complete a task? The rule of thumb is: When you finish the work, mark the task complete! You can do even more with tasks by adding subtasks and attachments. Subtasks break tasks into smaller parts. When tasks are complicated or more than one person is responsible, create subtasks. Subtasks function similarly to independent tasks with their own assignees, due dates, and descriptions, except they’re embedded in a parent task. To create a subtask, click the subtasks button next to the due date field in the right pane. Or, press Tab+S on your keyboard after you select a parent task. After you’ve created one subtask, select the subtask and press Enter on your keyboard to create another. Comment on a task to ask questions, or offer extra information and insight. Follow a task to stay informed on comments and changes. Followers of a task will receive notifications via My Inbox (in Asana) and email, according to their notification settings. To add yourself or someone else as a follower, use the Tab + F shortcut or click the + button at the bottom of the right pane. If you’re getting notifications for a task that you’re no longer working on, you can unfollow by hovering over your photo in the followers field and clicking X or click Following at the bottom of the right pane. You can also unfollow tasks and projects via My Inbox. My Tasks is your view of all the tasks that are assigned to you. It should be your first stop in the morning, as well as something you reference throughout the day to recalibrate your priorities. All new tasks that you create in My Tasks are automatically assigned to you and private to you. You can add them to projects to make them visible to the rest of your team. Give it a try and prioritize a few of your new tasks. You will only see the New Tasks, Today, Upcoming, and Later sections if each has at least one task. My Inbox is your notification center in Asana. Notifications for the tasks and conversations that you’re following are sent to your Inbox. Navigate to it from the top bar. Inbox, similar to an activity stream, lets you see what’s been happening and where you might want to focus your attention. You’ll see an orange dot next to My Inbox if there are unread notifications. Once you get used to checking My Inbox regularly, you may want to turn off email notifications. You can adjust your email notification settings from the drop-down at the top of My Inbox, or from My Profile Settings. To customize your account, click your profile picture in the upper right corner of Asana and select My Profile Settings. If you haven’t uploaded a profile picture yet, click on the circle with your initials in it. If you haven’t already done so, you should update your first and last name, upload a profile photo, and add your role and department so that you’re easily recognized. 10. Have fun with Asana! Like a task to show enthusiasm for it, offer agreement with someone’s comment, or express gratitude for a task completion. Simply click the thumbs-up icon wherever you see it—main pane, right pane, in your notifications, etc. Check out some of Asana’s experimental features by navigating to your Profile Settings and selecting the Hacks tab. Customize your Asana display with backgrounds. Check out the available backgrounds by navigating to your Profile Settings and selecting the Display tab. Thirsty for more Asana knowledge? Check out the power user checklist to learn how to use advanced features. Watch the 30-minute demo video for a more thorough product tour.